You’ll have to excuse me, if at first I seemed a bit skeptical of “vacuum distillation.” My previous experience with a gin extolling the virtues of its lower temperature distillation process was the estimable Oxley Classic Dry Gin. And although Oxley was an alright gin, I thought that the emphasis on process was disproportionately to justify what I felt was a rather exorbitant cost (~60 dollars). 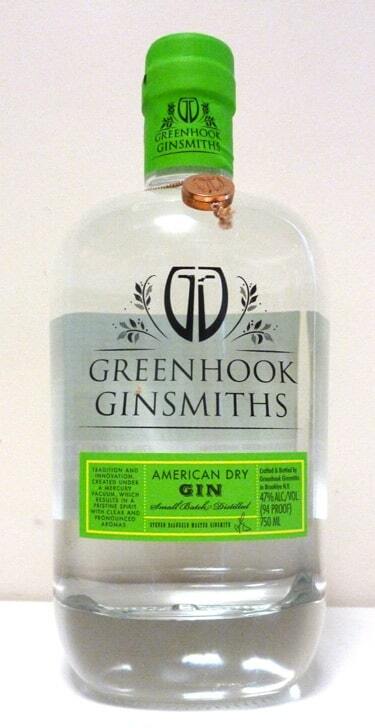 So naturally, when Greenhook Ginsmiths’ American Dry Gin hit the market at half the price of the market’s biggest name in vaccum distillation, I was intrigued. When I saw the botanical list, I was even more intrigued. Of course there’s going to be some juniper, but it was the supporting cast which caught my eye. Ceylon Cinnamon [also sometimes referred to as “True Cinnamon” which I think is a bit sweeter and brighter. This may be a cinnamon-geek note here, but I think it makes a difference], along with Elderflower [the trend is alive!] and Chamomile [my favorite kind of tea and a rather unique note]. But another thing caught my eye- Tuscan Juniper. Like I said, I know my types of cinnamon, but origin-specific juniper is actually rather rare in botanical lists. Tanqueray 10 and No. 209 are among the other gins out there which mention Tuscan juniper as well. I’m not an expert, but before I digress again, Alcademics did a nice photo post of picking berries in Italy last summer. The nose smells sweet and inviting, a warm springy note of juniper and a bit of the cinnamon and chamomile. The overall character on the nose is rather classic in nature. The taste is where the gin truly reveals itself as squarely within the contemporary camp. The initial taste is a potent burst of Elderflower, nicely balanced with the some warm earthy notes, coriander and orris root predominantly. The middle is that bright note of cinnamon that was on the nose, hints of ginger?, but it all finishes with a warm and spicy note of juniper and that’s where the gin reveals its 94 proof heat. One of my favorite new drinks is the gin and tonic with a spiced tonic syrups. I feel as if Greenhook Ginsmiths’ Gin is made specifically to compliment this new section of the tonic market. The bold spices of the syrups compliment the cinnamon in Greenhook very nicely. I think that Greenhook mixes nicely, if hit or miss at times in some classic cocktails. Negronis, Martinis, Aviations, The Clover Club Cocktail are among the drinks where this gin shines, adding floral and spice notes to classic cocktails. But other classics like the Tom Collins or the Greyhound- very citrus forward, I felt didn’t do this gin justice and produce a memorable result. One cocktail that I want to highlight [and actually comes from Greenhook Ginsmiths’ website] is the Manhattan Avenue transfer. 2 parts gin, 1 part sweet vermouth and 1 part Cynar. Its a variation on the Negroni, with a little more gin and a different Amaro. Top notch and a nice cocktail which hits all of the high notes that this gin brings to the table. Best consumed: In a cocktail which emphasizes herbal, floral, or spice notes- but also smooth enough to drink straight too. Rating: A contemporary styled gin with a bold point of view, executed very nicely. Continuing proof that when it comes to gin, you can get a gin for under thirty dollars which tastes like you were on the tips of your toes reaching for the highest shelf. This is an excellent gin for those who love the dry juniper taste of gin with some rich background flavors that manage to still maintain a pure traditional taste. Delicious. One of my new favorites. Hope I can find this in Minnesota. Their Old Tom is good as well...makes a great Martinez, However, this could be your new favorite if you for a clear, smooth gin with a nice bite. Sounds good to me, Aaron. Given my love affair with Farmer’s gin (mainly because of the elderflower) I’m sure I’ll like this one as well. I love all types of gins. At the top of my list, in no particular order, are: Millers Westbourne, Distillery 209, Perry’s Tot, Hendricks and this wonderful Greenhook Ginsmiths. In fact, the Greenhook maybe the best G&T gin of the bunch! That’s a great list! And I definitely share an enthusiasm for many of those same gins, including Perry’s Tot, which is a review that has been waiting a long time on the shelf. Just tried the Greenhook for the first time this evening. A dry, juniper forward, gin with pronounced floral hints. Well rounded, but in my book, not as pleasant as, say, Bloom Gin for those who like a floral take on their dry gin. It’s closest companion seems to be Junipero, which is not a bad thing in my book. Overall enjoyable and one that I will go back to. Wonderful, just tried it this evening with Fever-Tree Indian Tonic Water. Juniper, cinnamon, elderflowers, balanced perfectly. Before I knew it the guests were all coming around for seconds and we were soon out of tonic water. Well done! Where can I buy it ??? I really wanted to love this gin. Always detracted no matter what form I tried it in.